“Never mind the superb technical accomplishment of his playing, it’s the musical and interpretative achievement that is so impressive here.” wrote the International Record Review about the young Czech violinist Josef Špaček, who is fast emerging as one of the most accomplished violinists of his generation. 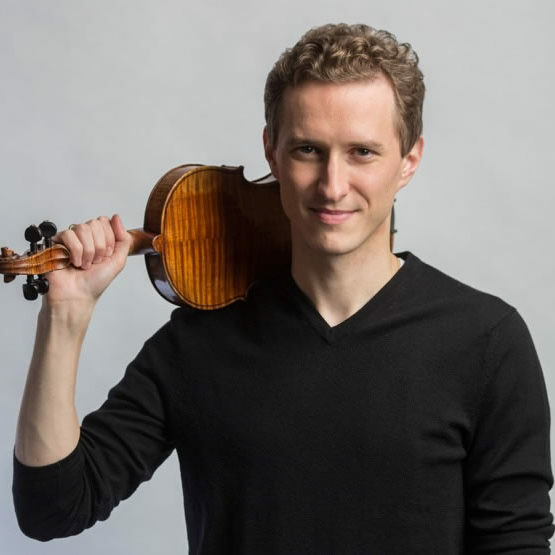 He has been guided by highly regarded pedagogues, including Ida Kavafian and Jaime Laredo at the Curtis Institute of Music and Itzhak Perlman at the Juilliard School. In May 2012 he was finalist of the International Queen Elisabeth Competition in Brussels; in 2009 Josef won the Michael Hill International Violin Competition (New Zealand) and both Third Prize and the Young People’s Jury Prize at the Carl Nielsen International Violin Competition in 2008. He currently combines a flourishing solo career with the position of concert master of the Czech Philharmonic Orchestra. Future and recent highlights include solo performances with the Czech Philharmonic conducted by Jiří Bělohlávek and Jakub Hrůša (including concerts in Prague, his debut in the Musikverein in Vienna in March 2015, a 5 concert tour in the UK in April 2015, and concerts in the USA and Australia), the Malaysian Philharmonic Orchestra and Alondra de la Parra, the Essener Philharmoniker and Tomáš Netopil in June 2015, the Orchestre Philharmonique de Luxembourg and Jiří Bělohlávek in December 2014, the Tonkünstlerorchester Niederösterreich and Jun Märkl in June 2015, the Kristiansand Symphony Orchestra and Giordano Bellincampi in January 2015, the Rotterdam Philharmonic Orchestra and Jiří Bělohlávek, the Netherlands Philharmonic Orchestra and Thomas Søndergård and the Shanghai Symphony Orchestras in the 2015/16 season, and the Tokyo Metropolitan Symphony Orchestra and Jakub Hrůša in the 2016/17 season, as well as recital appearances throughout Europe (including at the Rudolfinum in Prague, the Konzerthaus in Vienna and at Schloß Elmau), Asia and the USA (among others Kennedy Center, Washington). Josef has previously appeared with among others the Philadelphia Orchestra, Czech Philharmonic Orchestra, Prague Philharmonia, Auckland Philharmonia Orchestra, Kansas City Symphony, Queensland Symphony Orchestra, National Orchestra of Belgium, Czech Chamber Orchestra, Brno Philharmonic, Bohuslav Martinu Philharmonic, Janáček Philharmonic, Erkel Chamber Orchestra, Prague Symphony Orchestra and the Russian Chamber Philharmonic. So far he has worked with conductors including Jiří Bělohlávek, Jakub Hrůša, Christoph Eschenbach, Manfred Honeck, James DePreist, Asher Fisch, Roy Goodman, Eliahu Inbal and Rossen Milanov.